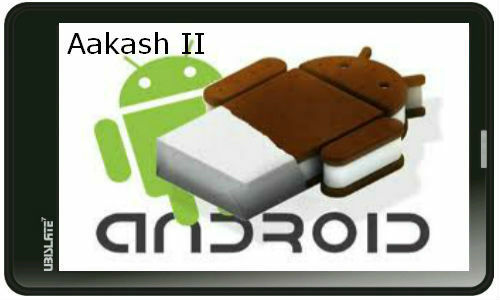 Aakash 2 to come with ICS pre-loaded? Aakash tablet 2 has set sail for and this time it is rumored to have pre-loaded Android 4.0 ICS. The highly touted tablet from India- the Aakash tab 2 is to set shipping in two or three weeks. The $35 tablet has gone over a makeover with the latest Google Android v4.0 Ice Cream Sandwich and some improved hardware. The Indian Government’s second generation Aakash 2 will have a 7-inch capacitive multitouch screen and a faster single-core, 800 MHz ARM cortex A8 processor, according to the CEO of Datawind, Suneet Singh Tuli. Also the tablet will originally be shipped with Android v 2.3 and then offered upgrades to Android v 4.0 after around 8 weeks of delivery. Tuli in an email mentioned about the product development being complete and deliveries to be expected in two or three weeks. The tablet will be priced $45 and the subsidized amount will be $35. The Indian government has budgeted for 5 million pieces of the tablet by the April 1 and the tablets further upgraded component prices are sure to come down. The original $35 tablet which was introduced in July 2010 was a subsidized low-cost computing device for students in the country. The shipments started late last year but the disputes between Datawind and the Indian Education Institution is responsible for providing specifications and even testing of the tablet. The Aakash 2 is a definite upgrade over the original $35 tablet, as the original tablet was 7-inches and ran on Android 2.2 with a slower 366 MHz processor based on an older ARM architecture however the Aakash 2 has 256MB of RAM and 2GB flash storage similar to the original $35 tab. The Aakash tab, meaning sky in Hindi is likely to be upgraded to a dual core ARM cortexA9 processor by the end of 2012. Many popular tablets from Samsung, Asus, Acer and Lenovo are equipped with the Cortex A9 processors, said Tuli. The fall of Cortex A9 dual core processor will bring the processor to the present day price range of Cortex A8, Tuli added. The Aakash tab 2 has already been marred by controversies and rumors. The Indian government was originally sought to buy 8 million to 10 million pieces of the Aakash tab by 31 March, which marked the end of India’s Fiscal year. But to the contrary the shipments have been much lower than the expected mostly due to the disagreements between Datawind and the Indian Institute of Technology, Rajasthan which is primarily responsible for providing specifications and field testing of the device. Tuli said that the difference among Datawind and IIT-Rajasthan is concerned about the testing criteria used to see if the tablets met certain requirements. The original parameters for the Aakash tab 1 were shock, water resistance, temperature, dust and humidity. Following the dispute, IIT-Rajasthan has been removed from the project and the Aakash project has been transferred to the IIT-Bombay. IIT-Bombay will be the first buyer of the Aakash 2 and purchase about 100,000 units. > Notebook / Laptop Reviews and News > News > News Archive > Newsarchive 2012 04 > Aakash 2 to come with ICS pre-loaded?